This past week, the Mundane world saw the reveal of the cover for what is one of the most anticipated 2014 YA releases: The City of Heavenly Fire by Cassandra Clare. I've had a longtime love affair with The Mortal Instruments series. It's a fantasy world that I love to explore. I didn't think it would be possible for me to love a prequel series more, but the Infernal Devices books make up one of my favorite book series, entering the ranks with Graceling, Harry Potter, Divergent, The Girl of Fire and Thorns, Percy Jackson and the Olympians and its companion series, The Heroes of Olympus. Clockwork Princess was in my Top 13 Books of 2013 (a series of posts I plan to start shortly) -- it actually cracked the top three. It was everything that a final book in a series should be and it left me so, so incredibly hungry and hopeful for City of Heavenly Fire and to see how they all pull together. I won't gush too much about Clockwork Princess here, since I do plan to review it in my Top 13 Books of 2013 later this month. The cover reveal has left me extremely anxious, though. I think part of that comes from a condition I call Allegiant-related-PTSD. I no longer have faith in final books and am extremely nervous that I will get my heartbroken by a book. 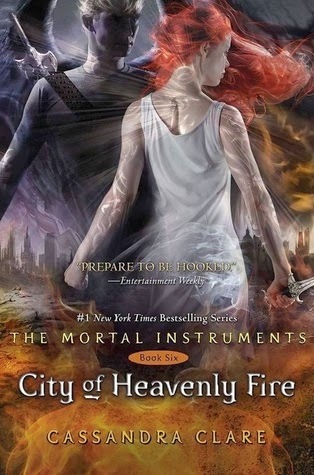 If you'll notice, Clary is wearing white on the cover, which for Shadowhunters, is the traditional wear for mourning. She is also with Sebastian on the cover. I don't take that to mean that she's going to end up with him (PLEASE GOD NO). But I do feel very nervous that someone will die at his hands. At this point, I can't imagine who could die that I'm not extremely attached to. And with the added twist that some characters from The Infernal Devices may show up, it makes me even more nervous because I'm so very attached to those characters. How are YOU feeling about City of Heavenly Fire? Nervous? Excited? Sad it's coming to an ending? Excited for more Shadowhunter adventures in Cassandra's new series? Talk to me!